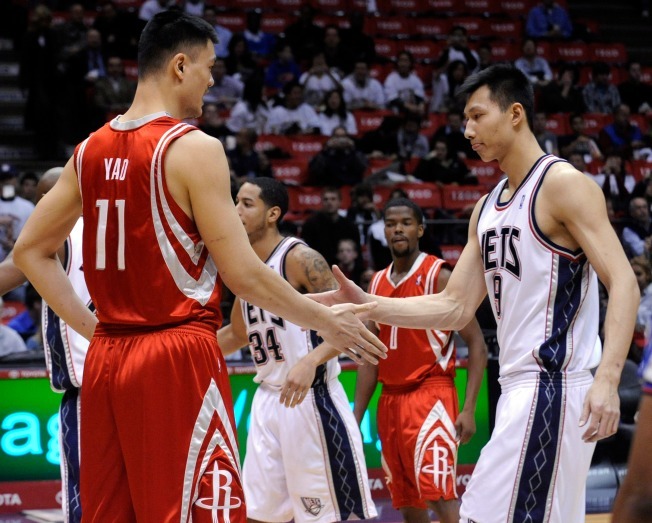 New Jersey Nets' Yi Jianlian, right, of China, shakes hands with Houston Rockets' Yao Ming before the opening tip off Monday night in Jersey. EAST RUTHERFORD, New Jersey — While Yao Ming won the showdown with fellow Chinese Olympian Yi Jianlian, the smallest player on the court stole the show from the 7-footers. Yao had 24 points and 16 rebounds and Aaron Brooks tied his career-high with 22 points as the Houston Rockets won their season-high fourth straight game with a 114-91 victory over the New Jersey Nets on Monday night in a game that was televised live to China. With Yao clogging the lane, the Rockets limited the Nets to a season-low 13 points in the first quarter in taking a 29-13 lead. Houston shot 58 percent for the game, including 9-of-19 from 3-point range. Keyon Dooling had 17 points to lead New Jersey. At Memphis, Tennessee, Kobe Bryant scored 36 points and keyed a late rally to help the Los Angeles Lakers snap a two-game losing streak with a victory over the Grizzlies. The Lakers trailed by 93-88 with 3:08 left, but closed the game on a 17-3 run, including 10 points from Bryant to overtake the Grizzlies down the stretch. Bryant was 14-of-23 from the field, part of Los Angeles shooting 54 percent on the night. Pau Gasol had 15 points, seven rebounds and had six assists in his return to Memphis. Gasol played six-plus seasons with the Grizzlies before being traded to Los Angeles in February. Rudy Gay led Memphis with 23 points. At Orlando, Florida, Jameer Nelson scored 22 points going 9-for-9 from the field to help the Magic rout the Warriors. Nelson had 13 points and four assists in the third period when the Magic blew open a close game with a 22-9 run on their way to their fifth straight win of the season. Rashard Lewis scored 21 points and Dwight Howard added 11 points and 11 rebounds for the Magic, who held Golden State to just 31.9 percent shooting for the game. Jamal Crawford led the Warriors with 18 points, but was 7-for-21 from the field. At San Antonio, Tony Parker committed five turnovers in the first 10 minutes but overcame the rough start by scoring 18 points to lead the hosts to victory over the reeling Kings. Parker was 8-of-17 from the floor and added six assists in 28 minutes as San Antonio (17-10) won for the eighth time in 10 games. The Spurs shot 52 percent and led from the 5:38 mark of the first quarter. They were 7-of-15 from the 3-point line. Sacramento (7-22) was held to 40 percent shooting in its fourth loss in a row. The Kings are 3-17 since opening the season 4-5. They dropped to 2-13 on the road. At Los Angeles, Chris Bosh scored 18 of his 31 points in the fourth quarter as the Raptors beat the Clippers to snap a five-game losing streak. Zach Randolph had 19 points and eight rebounds for Los Angeles during a foul-plagued 28 minutes, and left the game with 10:44 to play after bruising his left knee in a collision with Jake Voskuhl on a layup. Jermaine O'Neal added 23 points and nine rebounds for Toronto. Rookie Eric Gordon also scored 19 points for the Clippers, coming off a 119-85 drubbing at Milwaukee that ended their 2-2 road trip. At Denver, Nene scored 19 points and had 11 rebounds, while Chauncey Billups added 19 points and 10 assists as the Nuggets overcame the absence of Carmelo Anthony to beat the Trail Blazers. Five players scored in double figures for the Nuggets, who ended a three-game losing streak. LaMarcus Aldridge had 20 points and Travis Outlaw had 15 for the Trail Blazers. Brandon Roy, who scored 52 points against Phoenix on Thursday, was held to eight. Anthony sat out with what the Nuggets called a right elbow contusion, which has bothered him since training camp. He will also miss Tuesday's game in Portland and Friday's home game against Philadelphia.